Photo: Marysville Special Education Teacher Janice Holstine (left) uses growth mindset to help students like Omar persevere. 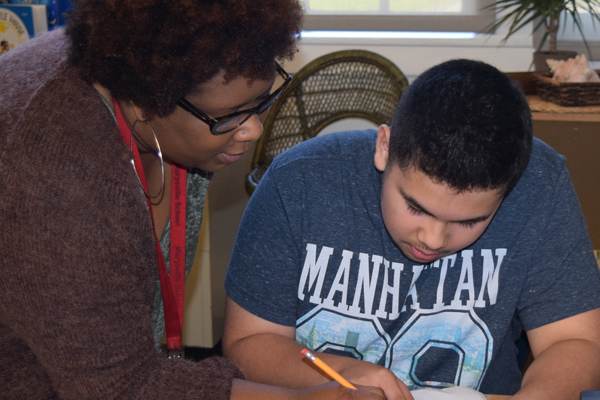 It’s been a bumpy school year for Shadow Project student Omar, 13, but goal setting and growth mindset—the belief that perseverance through struggle leads to success—are helping the Marysville eighth grader get ready for high school. At the beginning of this quarter, Omar wrote a letter to himself with the goal of boosting his grades and working on his attitude. Omar’s special education teacher Janice Holstine, M.S., says: “Omar is working hard, coming in at lunch to make up work, and he wants to finish the quarter strong. He just doesn’t quit. Janice uses books and school supplies from The Shadow Project as an incentive for students’ to meet goals. “But sometimes, they don’t meet their goal for the quarter and that’s okay,” she said. “We look at the roadblocks and what they need to change to improve next time. “Now that Omar has this mindset of ‘I’m getting ready for high school, I have four years to succeed, and I’m off to college,’ he’s starting to pick himself up by the bootstraps and ask for help.